In Autumn 2014, a covers group called Spektakulatius asked me to record two albums (a total of 28 songs) for them over a single five-day session. Budget limitations precluded the use of a purpose-designed studio, so we recorded on location in the function room of a former guest-house, a 12x6m room with a 3.5m ceiling height. An unfurnished 4x5m spare room nearby served as a control room. 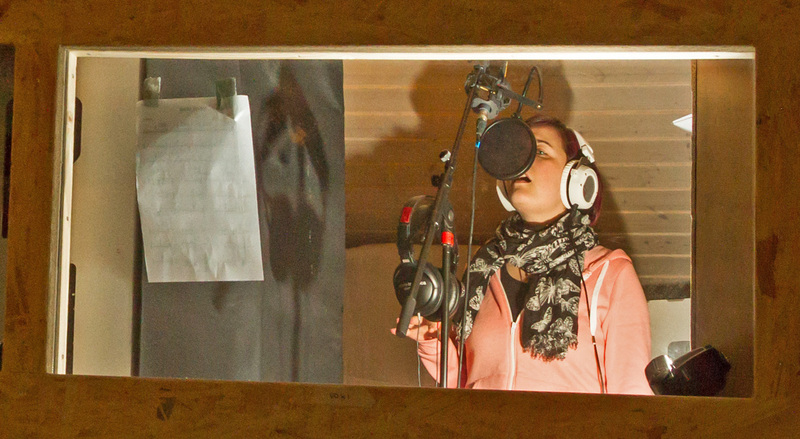 Given the work-rate required, I decided to record the musicians as an ensemble wherever possible, the main exception being that the band's vocalists were set up in a DIY isolation booth so that their takes could be edited independently if necessary. In addition, the band were keen to minimise their mixdown workload, so we made a strong commitment to capturing appropriate sounds at source during recording. Part of the challenge of the session was simply the logistics of recording so many songs in such a short space of time, particularly because the band were covering songs in many different styles and because the instrument and vocal line-up were different for pretty much every number. For detailed information about how I dealt with these practicalities, check out Sound On Sound magazine's June 2015 'Session Notes' column. However, that article only includes basic information about the mic techniques I used, so I've set up this additional web page to provide full details of how one of the songs ('Wayfaring Stranger') was recorded. The whole band were recorded as an ensemble in this instance, without any overdubs. 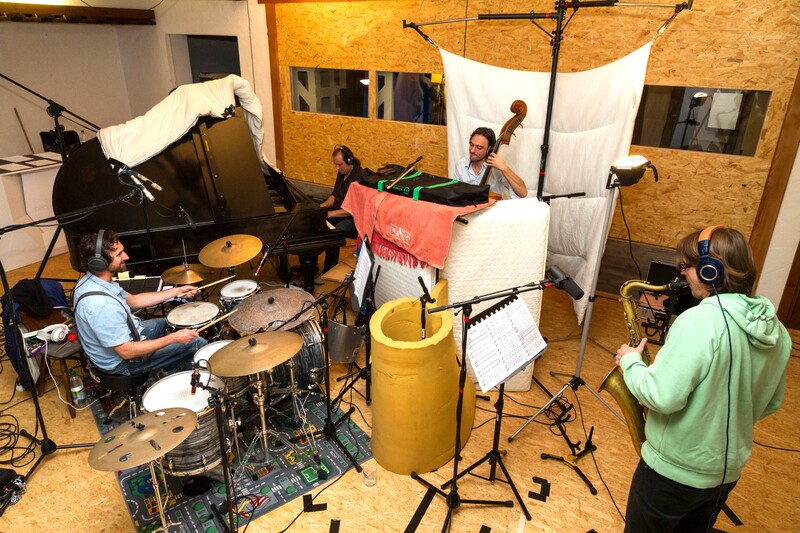 Drums, upright bass, grand piano, and saxophone played together in the main function room, while the lead vocalist sang in the vocal booth. For readers of my book Recording Secrets For The Small Studio, this setup also provides a real-world case-study of the more advanced dominant-array, peer-array, and freestyle ensemble-recording techniques that I explain in depth in Chapters 9, 10, and 11. Because spill between the microphones in ensemble recording setups affects the sound so substantially, it's difficult to evaluate any individual instrument's captured timbre simply by soloing the mic(s) you've notionally assigned to it. The only way to be sure you're getting a usable ensemble sound is to create a rough mix of the signals while you're recording. So, for demonstration purposes, I'm going to walk through the process of building this kind of rough mix, discussing the placement of each mic in turn, and demonstrating with audio examples how each signal impacted on the full ensemble sound. I usually like to start with the mics that are likely to pick up the most spill, so I chose the drum overheads, because we didn't have any real options available for baffling those off. Recording Chain: Audient ASP008 mic preamp → SSL X-Desk → recorder line inputs. No processing was used on these mic signals during recording, but they were panned for player's perspective. Rough Balance For Tracking: Here's a snippet of the raw overheads recording (WAV/MP3 ). As you'd expect from the picture, the mics place the snare a little to the left of centre in the stereo panorama, while the ride and kick-drum are pretty much central. 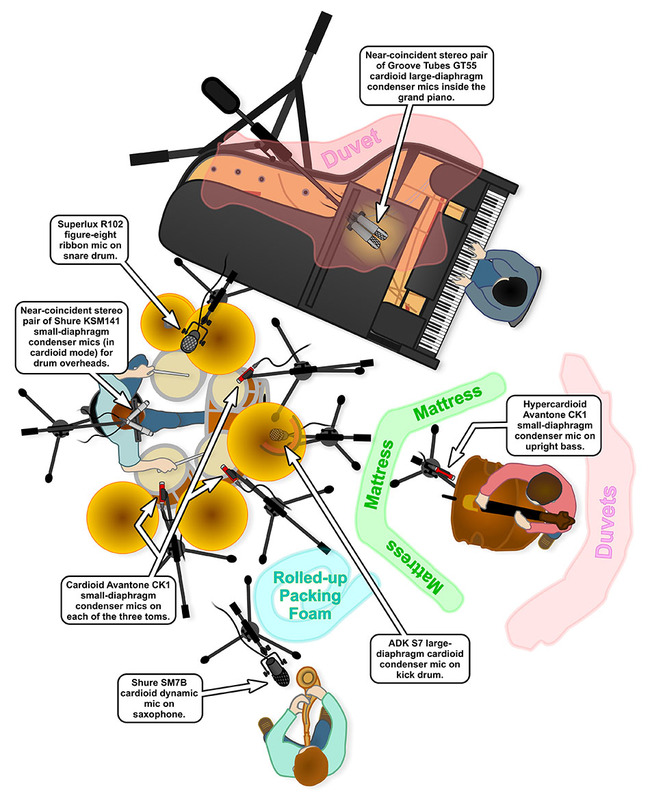 The strongest spill is from the sax off to the right, but the piano is also fairly prominent towards the left of the image. The bass comes through very little, partly by virtue of its lesser acoustic power, and partly on account of the baffling I placed round it to reduce spill on its own mic. Further Processing At Mixdown: The only processing these mics received at mixdown was a little transient processing to smooth stick noise from the ride cymbals, which had been slightly overemphasised by the mic positioning. Here's what the processed version sounded like (WAV/MP3 ). Mic: Superlux R102. This is an active ribbon mic with a figure-eight polar pattern, and costs around $130. I placed it over the kit, 50cm above the edge of the snare, and aimed it back towards the drummer so that the polar pattern's null plane would help reject both the saxophone and the nearby ride cymbal. Recording Chain: Audient ASP008 mic preamp → SSL X-Desk → recorder line inputs. No processing was used on this mic signal during recording. Rough Balance For Tracking: Here's a snippet of the raw snare-drum recording (WAV/MP3 ). Given the comparatively distant placement of the mic, it's no surprise that there's a bit of everything coming through it, but the polar pattern has nonetheless managed to favour the snare in the balance relative to the sax and ride, which still allows rebalancing potential when the snare and overhead mics are combined (WAV/MP3 ). I left the snare mic panned centrally, which pulls it to a significantly more central location in the drumkit's stereo image. (Likewise, of course, the saxophone and piano spill in the snare mic signal also shift those instruments a little towards the centre.) Experimenting with inverted polarity for the snare mic signal, this gave a much less satisfying combined drumkit timbre (WAV/MP3 ), thinning the snare and kick and undesirably favouring the ride cymbal in the balance, so I left the polarity unchanged. Further Processing At Mixdown: The only EQ this mic received at mixdown was a 38Hz high-pass filter to counteract the general build-up of low-frequency spill (WAV/MP3 ). However, once the rest of the microphones were in the mix, I also decided to apply limited-range gating to the snare mic to prevent its spill from pulling the saxophone too far back in the depth perspective (WAV/MP3 ). Mic: ADK S7. This is a large-diaphragm cardioid condenser microphone with high-SPL capacity, now superseded by the same company's Odin, and cost around $250. Because I already had a decent amount of kick definition coming through the snare mic, I used the kick mic primarily for low-end weight. To combat sax spill, the mic was baffled with both an SE Electronics Reflexion Filter and a roll of packing foam fixed to a spare mic stand. Rough Balance For Tracking: Here's a snippet of the raw kick-drum recording (WAV/MP3 ). The soft drum beater already gave a warm sound, which was enhanced by the proximity-effect bass boost and the lack of a direct line of sight between the mic and the batter head. Mixing it with the snare and overhead mics gave two slightly different kick tonalities depending on whether kick mic's polarity was inverted (WAV/MP3 ) or not (WAV/MP3 ), but that didn't affect the rest of the mixed sound much otherwise, because it contained so little spill from other instruments. In the event, I settled on the default polarity setting. Further Processing At Mixdown: The untreated acoustics in our makeshift control room on location made it difficult to judge the low end of the spectrum, and in this case I overcooked the low-frequencies on the kick drum. It was easy to sort this out with a high-pass filter at mixdown (WAV/MP3 ), but the snare-mic mix processing also robbed me of a little kick-drum definition in the midrange, so I ended up using a couple of bands of peaking EQ to redress this too (WAV/MP3 ). The polarity setting for this mic channel was also revisited, and I eventually preferred the inverted signal. Mics: Avantone CK1 (x3). The Avantone CK1 is a small-diaphragm condenser microphone costing around $150. It has three interchangeable capsules providing omni, cardioid, and hypercardioid polar patterns. I was happy to rely on my overhead mics for most of the tom sound, so I placed the tom spot mics fairly close to the drums (about 10cm above the edge of each drum's rim) for attack and definition, using the cardioid polar pattern to get reasonable spill rejection without too much 'spotlighting' of the drum head. As it turns out, the toms aren't actually played at all in this song, but I still recorded these microphones in case they contributed some useful ambience 'glue' to the drum kit as a whole. Recording Chain: Audient ASP008 mic preamp → SSL X-Desk → recorder line input. 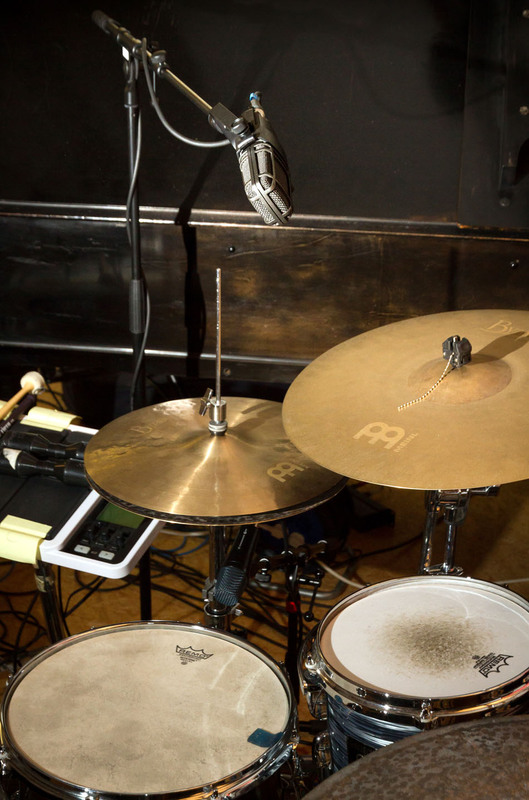 In the X-Desk, the high rack tom's mic signal was polarity-inverted; and the mics were panned left-centre-right (from player's perspective) to feed a stereo pair of recorder inputs. No other processing was used on these mic signals during recording. Rough Balance For Tracking: Here's a snippet of the raw toms pair (WAV/MP3 ). Not particularly impressive in isolation, it has to be said, and notice too that the high-rack-tom mic is making the saxophone spill appear to come from the wrong side of the stereo image some of the time. That said, I didn't think the sax-imaging vagueness would be distracting once the sax's close-mic signal was in the mix, and mixing in the tom tracks did contribute some extra cymbal richness (WAV/MP3 ) when compared with the simple overheads+snare+kick mix (WAV/MP3 ). Inverting the tom pair's polarity didn't work quite as well (WAV/MP3 ), seeming to distance the snare and add a slightly edgy quality to the ride cymbal, although the difference was admittedly quite subtle! Further Processing At Mixdown: The tom pair received no further individual processing at mixdown, although the panning of the left and right channels was narrowed slightly to match the width of the drumkit as a whole (WAV/MP3 ). In response to the EQ I applied to the kit at mixdown, I ended up preferring inverted polarity for the tom mics, despite my initial impressions while tracking. Mic: Avantone CK1. This is the same $150 small-diaphragm condenser mic I used for the toms, but this time I took advantage of its hypercardioid capsule to combat spill from the other instruments. The mic was 20cm away from the instrument, 10cm right of the bridge (from player's perspective) at the level of the player's right-hand fingers (ie. roughly 15cm above the 'F'-hole). 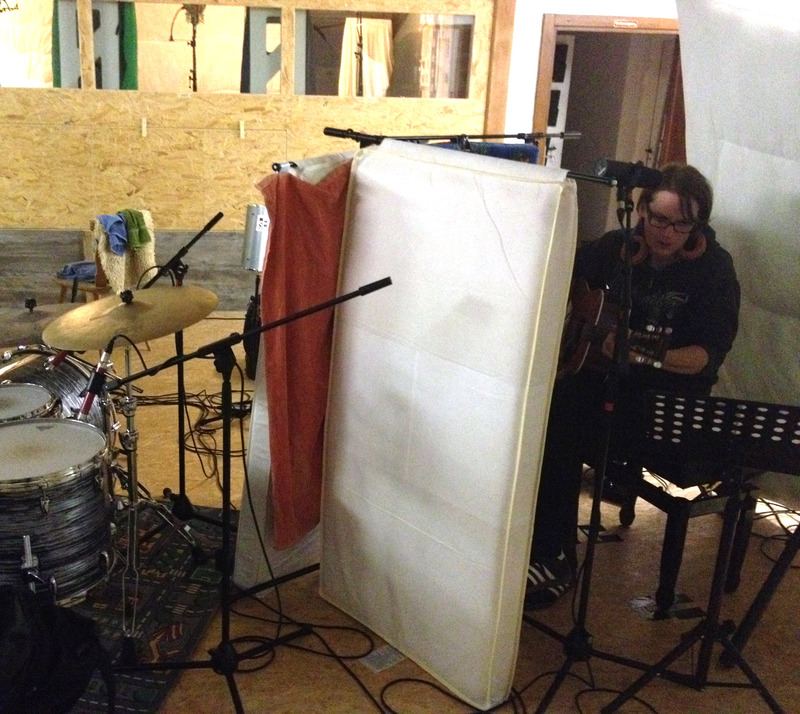 The DIY gobo (made from mic stands and mini-mattresses) and hanging quilts were also attempts to reduce spill. Part of the reason I took extra spill-reduction precautions with the bass was because I knew the instrument was being overpowered a bit acoustically in the room. However, I was also pretty sure I'd want to compress the bass for extra consistency and sustain in the final mix, and that would have exacerbated any spill problems. As an additional safety measure I also took a DI signal from the instrument's built-in bridge pickup. Recording Chain (Mic): Mackie 1604 VLZ3 mixer → recorder line input. The close miking position was making some of the instrument's machanical noises a little harsh, so I smoothed those off with a 6dB cut from the Mackie mixer's built-in 12kHz shelf EQ. Recording Chain (DI): Radial Pro48 active DI box → Dbx 376 channel → recorder line input. I cut 3dB at 3kHz with the Dbx's mid-band EQ to make the signal a little less 'wiry', and also compressed with the Dbx's soft-knee 'overeasy' mode at a 2.5:1 ratio. Rough Balance For Tracking: Here's a snippet of the raw bass mic (WAV/MP3 ), which delivers a fairly warm and well-balanced sound with reasonable separation from drum and piano spill. The saxophone spill is still very strong, however, and there was little else I could now do against that without removing the saxophonist to a separate room -- something I was worried would adversely affect the musicality of the performances. So I resolved to supplement the mix with some of the spill-free DI signal (WAV/MP3 ). When combining the mic and DI, it didn't make a huge difference whether I inverted the polarity of the mic (WAV/MP3 ) or not (WAV/MP3 ), although I marginally preferred the default polarity. When mixing the two bass signals with the drumkit mics, however, I definitely preferred the default polarity match (WAV/MP3 ) to the inverted-bass-signal version (WAV/MP3 ) -- although the absence of bass spill on the drumkit mics protected the bass itself from comb-filtering damage, the polarity inversion made the sax spill appear much louder and more strident. Further Processing At Mixdown: At mixdown I bussed the mic and DI signals to a single channel for processing. General balancing work involved a 20Hz high-pass filter to remove unwanted subsonics; 2-5dB of soft-knee compression at a 2:1 ratio; and some midrange EQ contouring in the form of a 2dB cut at 150Hz and a 5dB boost at 700Hz (WAV/MP3 ). The only more advanced processing I used was a single narrow band of dynamic EQ at 78Hz to even out an unpredictable sporadic resonance in the instrument itself (WAV/MP3 ). Mics: Groove Tubes GT55 (x2). These are large-diaphragm cardioid condenser mics, which originally cost around $400 each, but have now been discontinued. I wanted to set them up as a coincident pair, to give me maximum control over the piano image without inter-channel phase problems, but in the end I settled for a side-by-side near-coincident configuration so that I could mount them both on a single large mic stand for easier repositioning. The mics were positioned 20cm above piano strings in the centre of the instrument, about 30cm back from the hammers. I used a mutual angle of 130 degrees in conjunction with the 5cm capsule spacing to arrive at an acceptance angle of roughly 130 degrees, which spread the strings fairly evenly across the stereo image, still delivered reasonable mono-compatibility, and helped compensate for the closeness of the central strings by biasing the captured balance towards the edges of the acceptance zone. (For more detailed explanation about these stereo-miking practicalities, see Chapter 8 of Recording Secrets For The Small Studio.) I'd deliberately oriented the piano so that its lid naturally provided a little spill protection, and I also draped a thick quilt over the piano to reduce the spill a little further. Recording Chain: Mackie 1604 VLZ3 mixer → recorder line inputs. No processing was used on these mic signals during recording, and they were panned for player's perspective. Rough Balance For Tracking: Here's a snippet of the raw piano pair (WAV/MP3 ), which has a reasonably clear stereo spread without overblown width. The mic placement deliberately favours the clearer midrange and high frequencies, because I wanted to avoid conflict with the kick drum or bass in the arrangement. Notice again, though, that the leftwards placement of the sax spill in the piano array's stereo image contradicts the sax's rightwards stereo placement in the stereo image of the drumkit's overhead mics. As with the toms pair, however, I preferred the player's-perspective panning aesthetically so accepted a little more imaging vagueness in the saxophone spill as a trade-off. Adding the piano to the drumkit and bass seemed to work best for me with the default polarity relationship (WAV/MP3 ), which not only gave a slightly clearer piano timbre than when the piano mics were polarity-inverted (WAV/MP3 ), but also made the saxophone spill appear less prominent. On some other songs I chose to adjust the panning of the piano mics to match the left-heavy piano spill in the overhead mics, and this is what it would have sounded like had I done that panning manoeuvre here (WAV/MP3 ), but I decided against it on this occasion, because the piano frequently plays without the sax in this song and I'm personally not a huge fan of having a lop-sided stereo picture. Further Processing At Mixdown: The only EQ applied to the piano pair at mixdown was a 40Hz high-pass filter to counteract the general build-up of low-frequency spill (WAV/MP3 ) and a 2dB cut at 2.2kHz to reduce frequency masking of the lead vocal (WAV/MP3 ). In addition, though, I also bolstered the instrument's high-frequency sustain with some HF-boosted parallel compression (WAV/MP3 ). Mic: Shure SM7B. This classic cardioid dynamic microphone only costs about $350, and I love the way it sounds on sax. For this recording, I left both of the mic's frequency-contouring switches in their 'flat' positions. The mic was about 40cm away from the instrument, pointing about 30 degrees downwards towards the player's left hand. Recording Chain: Mackie 1604 VLZ3 mixer → recorder line input. No processing was used on this mic signal during recording. Rough Balance For Tracking: Here's a snippet of the raw sax recording (WAV/MP3 ). Between the acoustic power of the saxophone in the room and the well-controlled directionality of the mic, it's hardly surprising that there's not much spill on this mic. So when I came to mix this signal in with the piano, bass, and drums, it was naturally the sax timbre that I concentrated on when choosing a polarity setting for the SM7B. In the end, I preferred the default setting (WAV/MP3 ) to inverted polarity (WAV/MP3 ), as the latter made the saxophone feel a bit bloated, especially during its solo sections. Note also that I've panned the mic about 35 percent to the right in these examples, although I didn't end up panning it quite that far in the final mix. Further Processing At Mixdown: At mixdown I applied a 38Hz high-pass filter to counteract the general build-up of low-frequency spill (WAV/MP3 ) and a 19kHz low-pass filter to soften the tone of the cymbal spill (WAV/MP3 ). In addition, I applied 2-5dB of soft-knee compression at a 2:1 ratio for general mix-balancing purposes (WAV/MP3 ). Mic: AKG C414B-XLII. A slightly brighter-sounding cousin of the well-known C414B-XLS, this large-diaphragm multipattern condenser microphone was, at around $1100, more than twice the price of any other microphone on the session. Funnily enough, though, I've never been a huge fan of it for vocals, and only considered it for this purpose with Spektakulatius because they needed four vocal mics simultaneously on some of the songs. Fortunately it happened to suit this particular singer reasonably well! I set the mic to a supercardioid polar pattern (to help reject spill from the other singers in the vocal booth on other songs), and experimented with the miking distance, height, and angle to tweak the captured tone, using a popshield to keep the singer's position consistent. In this case, the final miking position was just above the singer's head height at a distance of around nine inches, pointing slightly downwards towards her eyes. Recording Chain: Mackie 1642 VLZ3 mixer → Dbx 266 compressor → recorder line input. No EQ was applied to the vocal during recording, but it was compressed 4-10dB through one channel of the Dbx 266, using a 2.5:1 ratio in the unit's soft-knee 'overeasy' mode. Rough Balance For Tracking: Although the basic vocal timbre (WAV/MP3 ) is fine, with hindsight the compression setting used for recording was too severe, with the result that the sibilance was overemphasised. You can also hear that a significant amount of lower-frequency spill is still reaching the microphone through the wall and window of the DIY vocal booth -- although not enough to prevent editing between different vocal takes if necessary. Here's the vocal track within the context of the full-band rough mix (WAV/MP3 ). Given the minimal band spill on the vocal mic, and the lack of appreciable vocal spill on the band mics, polarity-inverting the vocal signal relative to the instruments makes negligible difference (WAV/MP3 ). Notice, however, that the lack of vocal spill also means that the singer feels very dislocated from the rest of the ensemble sound, rather than blending with it naturally. Further Processing At Mixdown: During the mix I applied a 64Hz high-pass filter to nix the low-frequency spill (WAV/MP3 ) and another couple of EQ bands for general mix-balancing purposes: a 2dB cut at 195Hz and a 1dB boost at 560Hz (WAV/MP3 ). I then applied a band of dynamic EQ cut at 11kHz (WAV/MP3 ) and some high-frequency transient reduction (WAV/MP3 ) to troubleshoot the overemphasised consonant sounds. Combatting the vocal's lack of blend with the ensemble involved adding extra stereo-widening and ambience-reverb send effects just to that track. SPILL CAN BE YOUR FRIEND! 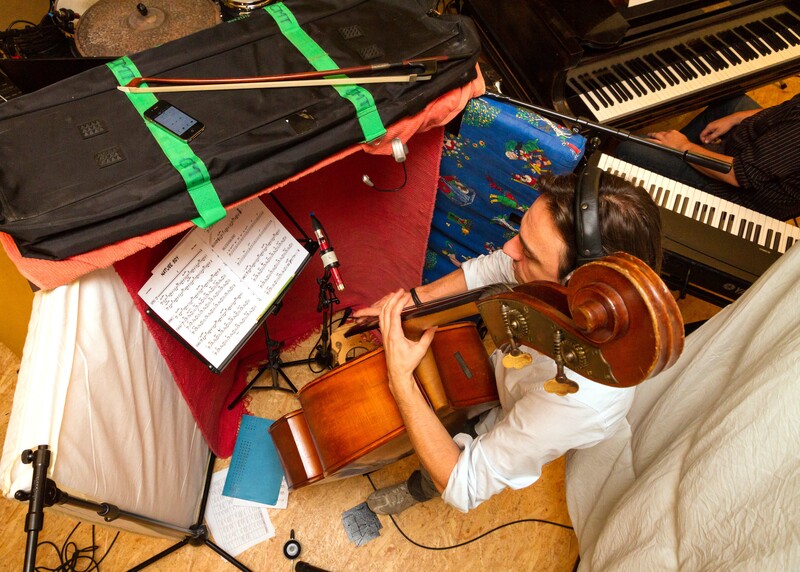 In my opinion, too many small-studio engineers try to minimise spill at all costs when recording ensembles. 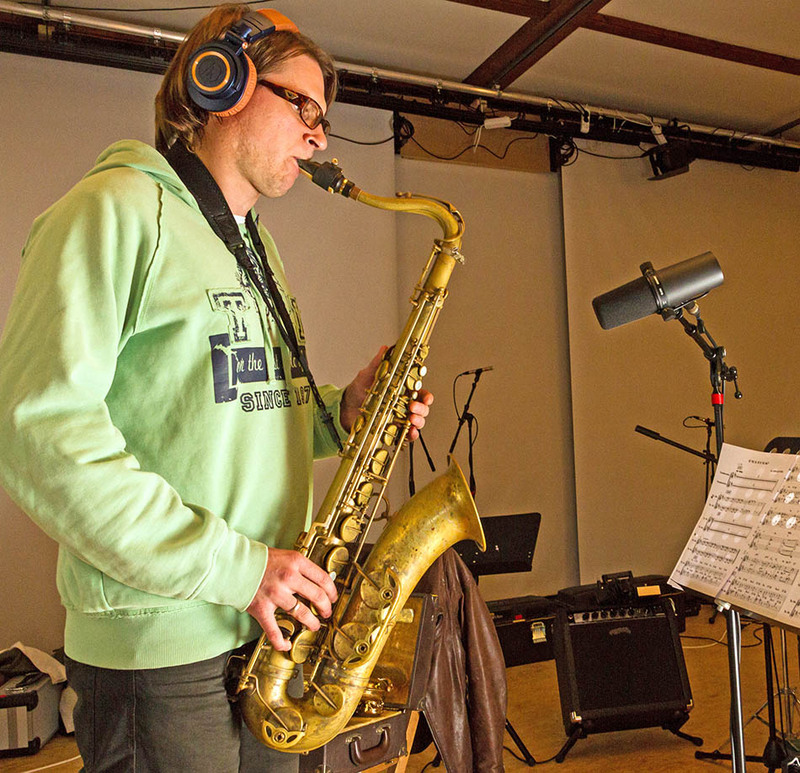 This recording session demonstrates a couple of important ways in which spill can actually work to your advantage, even when you're not working in an acoustically designed recording studio. Enhanced Sonics: Because every instrument in the ensemble is being picked up from many different angles by multiple mics, you tend to get a richer and more three-dimentional sound from each one. To demonstrate this, let's go back to the full-band rough mix (WAV/MP3 ) that we arrived at just before adding the isolated lead vocal track in Step 8 above. Now compare the sound of each main instrument in that mix with the sound of it soloed (ie. without any of its spill through other mics in the room): drumkit (WAV/MP3 ); bass (WAV/MP3 ); piano (WAV/MP3 ); saxophone (WAV/MP3 ). Bear in mind, too, that the mics you're hearing cost, on average, only about $265 each. Faster Mixdown: Using spill creatively during tracking typically makes your multitracks much quicker to mix. For example, the rough mix I've built up here for demonstration purposes (WAV/MP3 ) is already pretty respectable, despite using no mix processing whatsoever and very little processing during recording (ie. one polarity inversion, two bands of EQ, and two compressors). In addition, the final mixdown of this song (WAV/MP3 ) took me only about four hours, not just implementing all the per-channel 'Further Processing At Mixdown' points listed above, but also flattering the overall sonics with a pair of global reverbs, some master-buss processing, and copious fader automation. If you'd like to investigate the full raw multitracks of this song in more detail (or indeed have a crack at mixing them for yourself! ), you can download them from the 'Mixing Secrets' Free Multitrack Download Library. Any further questions about this session? Don't hesitate to get in touch! To underline how little mixing a small-studio ensemble recording can require if you make sensible decisions while tracking, I've put together the following short series of videos, in which I build up a new mix of a section of 'Wayfaring Stranger' from scratch. The players below stream 192kbps data-compressed audio, but you can also download a version of the video with lossless 24-bit/44.1kHz audio from the link beneath each player. The raw multitrack files for the song featured in this video can be found in the 'Mixing Secrets' Free Multitrack Download Library, along with my own full Reaper mix project. The Reaper demonstration project I created for this video can also be downloaded by clicking here. If you have any further questions about the videos, feel free to get in touch! Check out these two Sound On Sound follow-up articles for more detailed information on the mixing and mastering process for both these records: Mixing Article (SOS July 2015); Mastering Article (SOS August 2015). 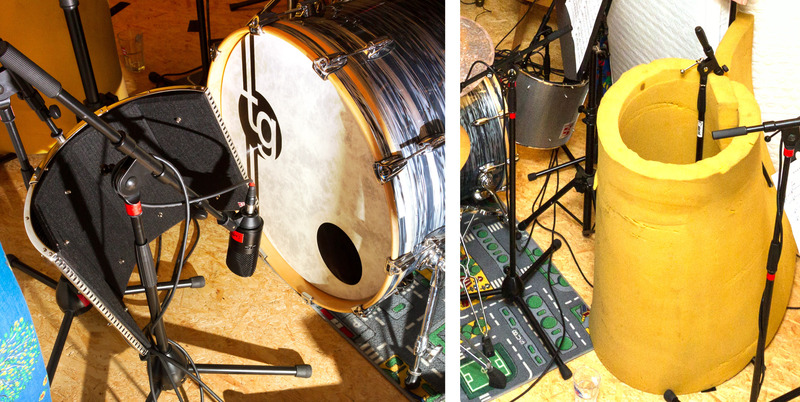 Drum Overheads: Initially I had these mics further forwards, but that made the cymbals too present. The mutual angle between the mics was also narrowed a little to keep the drums from sounding unnaturally wide in stereo. Snare Drum: I started the session with the drummer's preferred Sennheiser E906 on the snare (left-hand picture below), in a typical pop/rock close-miking position, but that really didn't suit the lighter-touch drum parts the band were using later on in the session. I tried using a Shure KSM137 cardioid small-diaphragm condenser mic for more high-frequency detail, but the drummer felt that sounded too harsh and forward. It was at that point that I reached for the Superlux ribbon mic, but initially placed it over the drummer's left shoulder, pointing towards the drum (right-hand picture below). Although this picked up a great sound, it also attracted way too much saxophone spill, which is why I moved it to its final position. Kick Drum: This microphone took quite a few placement attempts before it delivered the understated sound we were hoping for. In discussion with the drummer, he also suggested replacing his kick-drum beater with a softer one, which made a big difference. Toms: Those Avantone mics work really nicely on toms, in my experience, but even so I did a certain amount of work deciding on the most suitable miking distance. The angle of each mic was also quite important to the sound on this session. Bass: This was where the biggest turnaround happened. At the start of the session I set up the mattresses and duvet around the acoustic guitarist to keep him in the room with the rest of the band (see picture below). However, it quickly became clear that we needed to isolate the acoustic guitar, so I redeployed the baffling materials for the bass. Because I knew the bass would pick up a lot of spill, I also started off originally using a high-end large-diaphragm microphone from Brauner, with the hope that its well-managed off-axis response would make this inevitable spill sound better. There was so much spill on this mic, though, that I first tried using the SE Reflexion Filter there, and then abandonned the mic entirely in favour of the less high-spec, but much more directional, hypercardioid Avantone CK1. Grand Piano: The first-guess positioning for these mics was the closest I got to a 'hole in one' on this session. I moved them once to get a little bit more of the high-register strings, but that was the only tweak, beyond adding the quilt to take the edge off the drum spill. Tenor Saxophone: Although the Shure SM7B sounded fairly good on the sax straightaway, we got a significantly better result in another position after about the third or fourth try. Lead Vocal: I tried this singer on an SE Electronics Z5600A, but that really didn't suit her, even after two or three repositionings. Switching to the AKG C414B-XLII improved things, but I relocated this two or three times too before we arrived at the setup we used here. This type of one-room recording isn't just for acoustic music, either, because it also works really well with rock bands as well. For example, here are two such sessions I wrote about for Sound On Sound magazine's 'Session Notes' column, complete with extensive audio examples and raw-multitrack downloads: 'Recording Dunning Kruger' and 'Recording Brushes Held Like Hammers'. 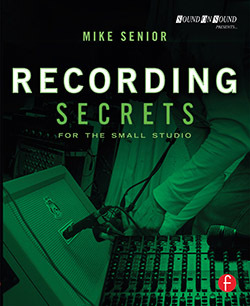 For a complete guide to all aspects of small-studio recording technique, check out my latest Focal Press book Recording Secrets For The Small Studio.